Russell Wilson entered training camp boasting about his offseason training program that shaved a few tenths of a second off his 40 yard dash time. He wanted to be faster, he said, so that defenders could not catch him from behind when he was scrambling for yardage. If it was up to me, he would have been spending that time trimming time off of a different aspect of his repertoire, his passing. Wilson has finished dead last in time to throw, among QBs who have taken at least 50% of their team’s snaps, every year he has been in the league, per ProFootballFocus.com. Even this year, only Tyrod Taylor has taken longer to throw the football. Last week was different. Last week may signal a new evolution in Wilson’s developing career. There is an unfortunate division among Seahawks fans: those who will point the finger at anyone but their quarterback, and those who see him as the primary problem with the offense. The truth should be far less polarizing. Wilson came into the league advanced in some places compared to other young quarterbacks and behind in others. He is still not a complete product, and that room to grow should be celebrated as long as he shows signs that both he and the organization recognize his need to improve. Time to throw is a crucial element in any quarterback’s game. Faster throws mean quicker decisions are being made, the offense is more likely happening within the intended framework, and the defense has less time to disrupt the play or hit the quarterback. Wilson has consistently been on the wrong end of this stat. Wilson’s most ardent supporters like to blame this on the Seahawks poor offensive line each year for his slow time to throw, with the logic that Wilson takes more time because he is running for his life. The evidence does not support that. 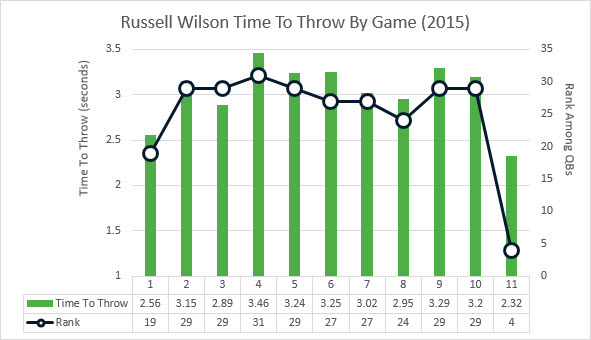 The chart above shows Wilson’s time to throw, and rank among all QBs in that category, each week of the 2014 season. His best week was the first game against Green Bay, with an average time to throw of 2.72 seconds and a rank of 18th. For the most part, he was the worst in this category each week, and often took more than 3.00 seconds to throw. He was sacked two times or less in nine games last year, and had an average time to throw of 3.12 seconds in those games. The games where he was sacked 3 or more times, his average time to throw was 3.29 seconds. That would lead one to believe that Wilson does take more time to throw when line is struggling in pass protection, but it simply goes from bad to worse. His absolute best game of the season last year was still 18th in the league. 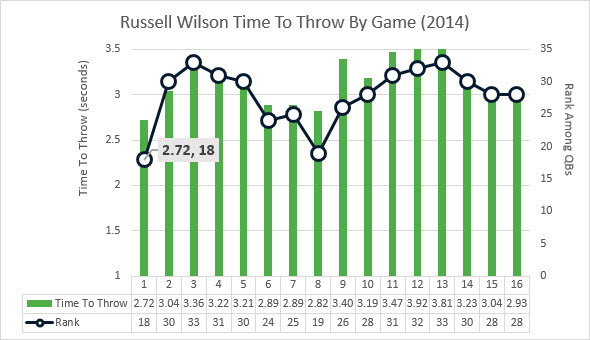 The more logical explanation of Wilson’s timing troubles comes down to two things: he has conscious about giving the ball away, and he is still learning the position. It should come as no surprise that the three players with the quickest time to throw last season were Tom Brady, Peyton Manning, and Andy Dalton. These are all players comfortable throwing from the pocket, who beat teams with their arms and not their legs. Wilson may never be among the leaders in this category due to his ability to buy extra time in the pocket. Aaron Rodgers, for example, took 2.82s to throw last year compared to Brady at 2.39s or Manning at 2.24s. What Wilson does need to do is prove he can play the pocket game and beat you when the need arises. The performance by Wilson last week was remarkable on a number of levels, ranging from his 5 TDs to 0 INTs to his gaudy 147+ passer rating. What nobody may have noticed, and could be the most significant aspect of his play was how his time to throw changed. Wilson played a game unlike any other in his career. 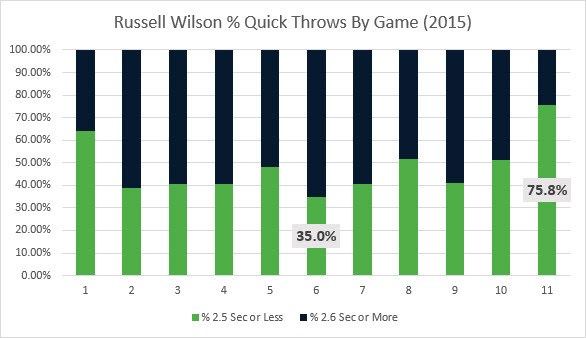 Only three quarterbacks posted better time to throw numbers than Wilson’s 2.32s. This was a total departure from standard Wilson gameplay. A hefty 65% of his passes took 2.6 seconds or longer just six weeks ago. He flipped the script last week with over 75% of his throws taking less than 2.5 seconds. That is exactly the kind showing that will get his teammates and coordinators fired up, and opposing coaches very worried. Wilson had never put a game like this on tape before. The book on him has been to contain him to the pocket and make him beat you within the framework of a standard passing game. In other words, the exact opposite game plan you would have for Brady or Manning. Imagine a team needing to defend Wilson like he was capable of throwing like Brady from the pocket, and just how vulnerable that would leave them to his scrambling. That should be the goal. Do not make Wilson a better athlete. Make him a better passer. 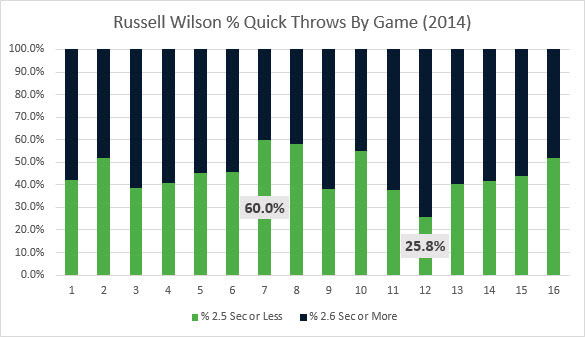 It is worth noting that these quick passes did not limit Wilson’s ability to create big plays. His 11.5 yards per attempt was his best of the season, and one of the best numbers of his career. The offense had 9 explosive passes, their most in any game this season. He was also not just throwing the ball away, as evidenced by a 70% completion rate. This was not only the best game of Wilson’s career, but could ultimately be his most important from a development standpoint. His ability to prove he can do this again might unlock a new stretch of offensive fireworks the team has not seen since he tortured the league with the read option late in his rookie season. Russell Wilson: The Next Steve Young? 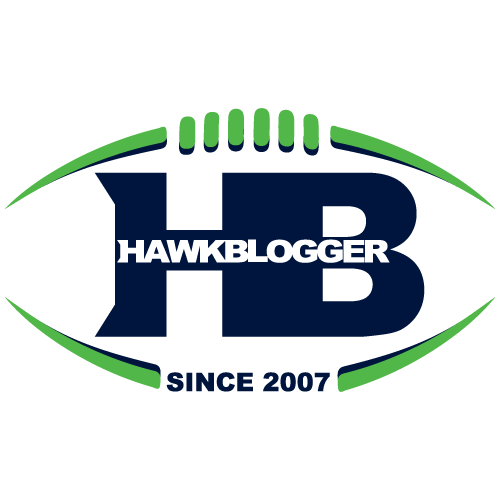 What If Russell Wilson Can Be Better?